Come on a deep ‘BookJourney’ with us, a deep exploration of what it means to be Loving your Life! using mBIT, NLP and Positive Psychology. This is a Generative BookJourney mentor/coaching experience. It is webinar based so you can do it from the comfort of your own home anywhere in the world. Learn in a supportive small group virtual environment and explore what it means to bring your human spirit alive and tap into your own inner wisdom. Based on the exciting new book ‘Loving your Life!’, and using mBIT, NLP and Positive Psychology, the journey facilitates you through a series of explorations and deep meditations on how to truly love your life, love your self and bring more loving into your life. As recent Neuroscience has shown, we have centers of intelligence, or ‘brains’, in our heart and gut regions. Each of your three brains (head, heart and gut) have their own domains of expertise, their own prime functions, and more importantly, their own ‘Highest Expressions’. Loving your Life! applies these profound insights to the context of truly bringing your life and spirit alive! 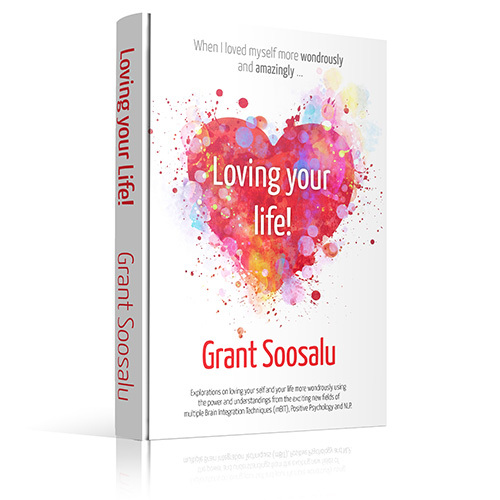 Based on behavioral modeling of people who are truly loving their lives, you can now use these insights to take your life to another level and truly be Loving your own Life even more amazingly! • 10 x monthly live one and a half hour Webinars in which you will be facilitated in exploring key distinctions from sections of the book. The book comprises 30 meditations/explorations on loving your self and your life more wondrously. Each monthly webinar will examine 3 of these explorations. • The monthly webinars will be recorded so you can watch or rewatch them at your leisure during the process of the journey. • Openframes – You will have the opportunity to ask questions and get answers on insights and explorations that you raise during the journey. • Peer Social Learning – You will get together via skype in small wisdom community groups once a month to do peer support reviews and discoveries and bring the material from the webinars alive in your own life. This will be social learning facilitation and you will be provided with worksheets, mindmaps and generative exploration guides to support you in these discovery processes. • A whole year of deep learning – The overall process runs for a whole year and represents an incredible journey of deep mBIT based self-discovery to provide generative learning and transfer of wise generative change in loving your life even more wondrously. Do you have questions? Ask me here and if you want to be a part of this fantastic group opportunity let me know here and I will send you the details.